A brand new game from mFortune, Robin's Reels is the latest addition to the brilliant mobile slots portfolio at this mobile-first casino. The gameplay is as spectacular as ever and the reel spinning action is lively and highly animated, with characters scattered in the background and interacting with the player at every spin. But of course, we're here to talk about the winning potential, which is huge. With two bonus games that can bring you multipliers in double digits pretty much the entire time, this is one slot that we wouldn't miss. After all, Robin Hood was famed to take from the rich and give to poor — we'll give that a shot any day! If you've been diligently reading all of our mobile slot reviews (and we know you were! ), you'll be familiar with our endless infatuation with mFortune casino and all of their games. Unique to this mobile casino and developed exclusively by In Touch Gaming, the new title Robin's Reels is much like the rest of the titles at mFortune. Same bet levels, return percentages, mini games and even a progressive jackpot are part of this game. Yet at the same time, the slot is novel in its theme and definitely stands out as one of the more adventurous and fun mobile slots within the mFortune games portfolio. mFortune advertise the total sum of money that it pays out every single month. For example, this February, they've already given away £47,723,115.10 to winners of their mobile slots and casino games, so it goes without saying they are pretty rich. And this is where the theme of Robin's Reels ties in perfectly: take from the rich and give it… to yourself of course! As you may have gathered, the slot is based upon the legend of Robin Hood and his mates, hiding out in the Sherwood forest and stealing money from the filthy rich to support the poor villagers. That's precisely what will happen within the slot as well, as Robin Hood stands to the right of the reels and jumps for joy if a big win is triggered. The graphics and the design also are beautifully reflective of the theme, as oak trees frame the reel set-up and a beautiful, summery background add to the authenticity. As much as we like the theme, Robin's Reels appear to be a rough re-skin of the other In Touch Games. It's a bit of a pity that developers fall into this trap of keeping things pretty much as they always are, but perhaps throwing in a novel feature to appease the players. This is exactly the case with Robin's Reels. The bets range from 2p to £12 (the same as every other mFortune title), there are fifteen paylines and five reels (same story with the other slots), the return to player is 96% (around the same ballpoint as other mFortune games) and there are two mini-games plus a progressive jackpot – all identical and heard of before. Think Little Red Riding Reels, Sherlock or Viking Storm. Probably this is a slot format that works well for the loyal players of mFortune, otherwise the continuous development of slots that all appear quite samey couldn't be justified. However, it does yield nice wins and a maximum of £6,000 can be won off the payline combos, not to mention the progressive jackpot, which is bound to rise and rise. So, we guess what we're saying is that this slot is nothing special in terms of gameplay or winning potential. It's a standard, albeit beautiful mobile slot, that's got an engaging theme to get lost in for months, discovering new features. But if you seek something truly innovative, this won't be it. On the other hand, mFortune is such a ‘home brand' that you just want to cozy up to its familiar games and play for hours and hours. How To Get Extra Spins On Robin's Reels? We have to mention that there are Wilds that can substitute for every other symbol except the Extra Spins and the Mini-Game ones. Keep in mind that a progressive jackpot cannot be won with Wilds as part of the winning combination, yet it will pay out a 300x multiplier. But we digress – let's talk about the Extra Spins! The Extra Spins symbol is a bag of golden coins and three of these will get you five Extra Spins, four means seven Extra Spins and five will get you nine Extra Spins. Then, using the same total bet sum, the Extra Spins are played through and that's pretty much it. Simple as that! You'll be glad to find out that multipliers are also applied to your winnings, depending on how many symbols trigger the Extra Spins: three = 10x, four =30x and five = 100x! Some mFortune games have three mini-games, but Robin's Reels boasts just two. Nonetheless, both of them are fun and are triggered quite often, so you'll have plenty of chance to reap their benefits. Actually, just two of the mini-game symbols will get you through to one or the other bonus round! First up is the Robin's Roulette – a mini-game where you can gamble your winnings. By no means unique, this feature is an exciting one, because you can take your line win and get a massive multiplier on it. You can place bets on roulette: red/black, even/odd and all of the numbers too. When you're done placing the chips on the table, click Spin and hope for the best! You can also opt out and click Collect if you don't want to gamble your winnings, but we'd say just go for it – it's fun! Second, Target Practise can also be triggered by just two bonus symbols and it's a mini game where you can randomly get yourself a nice multiplier. Ranging from 13x all the way up to 110x, depending on how many symbols triggered the mini-game. For example, if three Bow and Quiver symbols get you through to the mini-game, then the multipliers are 25x, 28x, 31x, 34x, 37x and 40x. Meanwhile, if five symbols get you to the feature, the multipliers are huge multiples of ten – 60x, 70x, 80x, 90x, 100x and 110x! So aim well and you could get a proper shot at multiplying your wins immensely. If you ask us, that's a great little feature and although it's random, it's fun picking which target you want to shoot at and actually see Robin take the shot – engaging and authentic too! Just as pretty much every other mFortune game, Robin's Reels was launched as a progressive jackpot mobile slot. The management always start their jackpots at £2,000, which is already a great sum of money, but you can expect extensive growth as the game gains pace and becomes more and more popular. For example, some of the games that were launched in the very recent past now have jackpots in excess of £5,000, £7,000 and £10,000. Meanwhile, some of the older ones have jackpots that can make you salivate even thinking about it. What about an incredible £137,000.00 progressive jackpot on the Vegas Vegas slot? Bring it on! Want to play Robin's Reels? 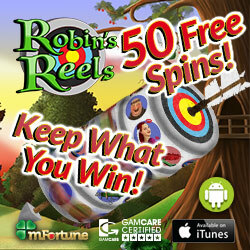 Robin's Reels is a smashing mobile slot filled with action and lucrative features! Robin's Reels We always love the news of a new mFortune game launching and Robin's Reels didn't disappoint. Designed and developed by InTouch Gaming, the mobile slot has got all the regular features and gameplay functions that the rest of the mFortune portfolio. The bet range is wide and the variance of the slot is low so that you can enjoy hours or play without busting your bank balance. Handily, you can deposit in game so there is no need to log out or stop the playing if you ever run out of money. Plus, did we mention there is a free £5 no deposit bonus that all newly registered players can claim at mFortune? Yup, and you get to keep the winnings too! The wagering requirements are just 1x so it's pretty much free cash handed straight to you - what's not to like? The Extra Spins round is fun and the two mini games are triggered often and can bring you lucrative multipliers. All of this is wrapped up in a nicely designed game, featuring engaging graphics. The only reason why we can only part with four out of five stars is because there is little innovation. So, the regular gameplay of Robin's Reels is all good and well, but there is nothing that will blow your mind.